The summer was approaching. Graduate school was ending, and I only had one more summer of freedom before I began my experiences as a dental student. I honestly was seeking a job that would keep me in Mississippi for the summer, but we all know that our plans and God’s plans might not also be the same. After meeting with Hispaniola Mountain Ministries’ Executive Director Scott Wilson several times, we was decided I would spend my summer as the ministry intern in both the Dominican Republic and Haiti; I was thrilled to begin my service with an organization that truly serves our Lord. The previous summer, I had spent a week in Haiti with HMM serving as part of a medical and dental mission team, and the aspect of “more harm than good” from short-term missions was completely put to rest in my mind. Hispaniola Mountain Ministries provides relief to countless people daily, whether it be by helping provide clean drinking water, homes in which to sleep, or food to eat, but the most important gift they provide is community that evolves around the Gospel. Without Jesus, humanitarian efforts are just temporary band-aids. I was blessed to serve alongside the local leaders and staff of HMM throughout the summer. We would handle the day-to-day jobs and all the behind-the-scenes duties that kept everything running smoothly. The locals made me feel like one of their own this summer. This sense of belonging made it even more clear to me that regardless of nationality, gender or race, we are all children of God and brothers and sisters in Christ. My take home message, you could say, was that God uses people differently to share the Gospel. As the “Americano” or the “blanc” in these countries, you can’t help but stick out. My job is to attract the Haitian community — not for myself — but for the sake of the local church. When I leave, the local leaders are still there. 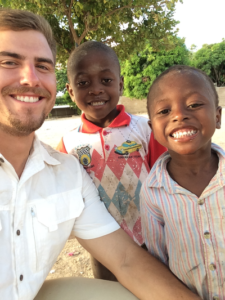 The best person to disciple a Haitian is a Haitian, and I am just a tool in their hands. HMM serves its purpose by empowering the local church and local leaders. Through resources, guidance and prayer we are able to assist these men to lead not only HMM, but also be the true servants of Christ in their communities. This summer was an experience that will stay in my heart forever. I was able to serve Jesus in a place filled with such love and pure joy. In the midst of poverty, love shines through, and it is all due to The Gospel. Nothing in the world is greater than God using you for His glory. I prayed daily that the Holy Spirit would lead me and guide me because without that guidance we cannot truly live the call to disciple others. God used me to bring forth His kingdom, whether it be by sharing what that cross represents, praying for health or singing praises with my brothers in Christ. All of these things would not be possible without the grace of God. In the second book of Timothy, Paul explains to Timothy that as Disciples of Christ, it is our duty and privilege to entrust what we know to other faithful men. Hispaniola Mountain Ministries is honoring this message and for me to have been a small part of it was a huge blessing.